The screen print on the shirt contains excess levels of lead. 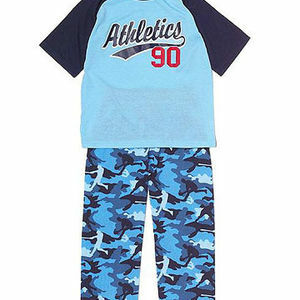 This recall involves about 28,000 long- and short-sleeved pajama sets. The sets have a blue shirt with a red screen print that reads "Athletics 90" and coordinating camouflage pants. The pajama sets were sold in boys' sizes XXS (2/3) to XL (14). The Children's Place stores nationwide and www.childrensplace.com exclusively from December 2006 to January 2008 for between $15 and $17. Take the pajama sets away from children immediately and return them to any Children's Place store for a full refund. For additional information, contact The Children's Place at (877) 752-2387 between 9 a.m. and 6 p.m. ET Monday through Friday, visit their Web site at www.childrensplace.com, or e-mail them at customerservice@childrensplace.com.